Anatomy of a Schism is unlike any other book about a church split. Most narratives of a split revolve around a theological or moral interpretation that becomes so difficult to walk together in that the only logical conclusion is to walk apart. What’s often lost in these narratives is the individual stories of people who experienced and dialoged about the schism as it was happening. In many instances, we can watch a news segment about a church split which may give an overview of what happened and inform the viewer that the once unified congregation will now be meeting in part at the park district and in part at the library. Rarely, do you hear the news anchor inform their audience about how the schism affected nine year-old Susan or ten year-old Jack. 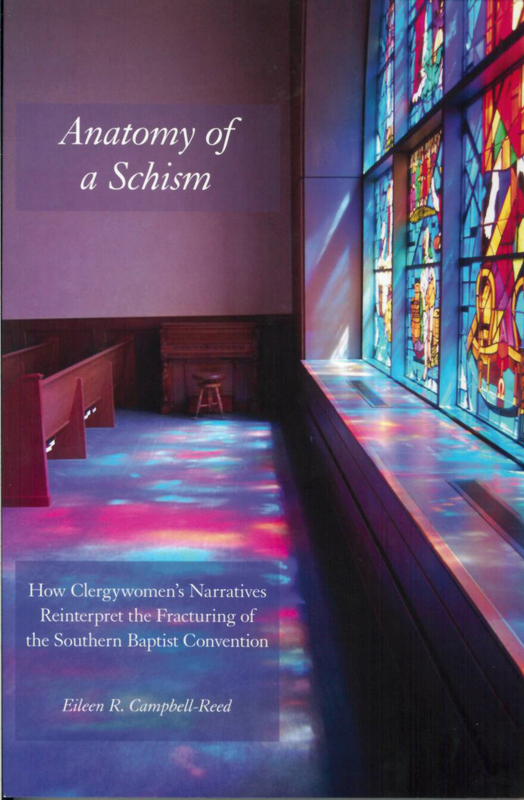 Anatomy of a Schism follows the narratives of Anna, Martha, Joanna, Rebecca, and Chloe. What is so unique to this book is reading each of their stories and relating to what they experienced. These women did not all attend the same Baptist church. They were not all from the same socio-economic and geographic location. They were not the same age when the struggles began and were at different ages when the struggles ended in a schism. However, taken together, their experiences shed light on how women hold strongly different views especially within their own denomination. The narratives of Anna, Martha, Joanna, Rebecca, and Chloe also give unique insight to what it was like to be Baptist and to have a call to ministry in the Baptist subculture. Clergywomen in the Southern Baptist denomination were often distanced from their male colleagues and were also viewed as different from women in the denomination that were not seeking ordination. For example, Anna had to go through a more rigorous interviewing process to attend seminary than her male counterparts. Chloe responded by practicing ministry in a way that reinterpreted the Southern Baptist schism as a space for creating and discovering a new theology of ministry. For some people within the Southern Baptist denomination, the schism became a contest between who was authentically Baptist and who was not. Part of the discussion on authentic Baptist identity revolved around how each person felt about a woman’s traditional role. While it was not ultimately the line in the sand for Southern Baptists, it was of great importance to the dialogue at hand. How everyone felt about traditional gender roles halted many other conversations. It became more relevant to be on the same page regarding the roles of women in the church. This became part of the struggle between the cultures of complementarity and mutuality. Each side claimed theirs was the authentic way of living in the Baptist tradition. For anyone that wants to have a more personal understanding of what it is like to be in the middle of a theological and sub-cultural struggle, this book gives the reader a glimpse. This book is also a helpful read for anyone in other denominations who are also struggling with defining the roles of women in the church. CBE reviews books on their own merit, whether or not an author has expressed agreement with CBE's values or mission elsewhere. A positive review does not constitute an endorsement of an author's entire body of work or of any institutions they represent. Likewise, a negative review is not a condemnation of an author's body of work or associated institutions.